I thought it was about time that I did another skincare brand focus post because this category has been dominated by makeup brands for the past few months (check them out here). 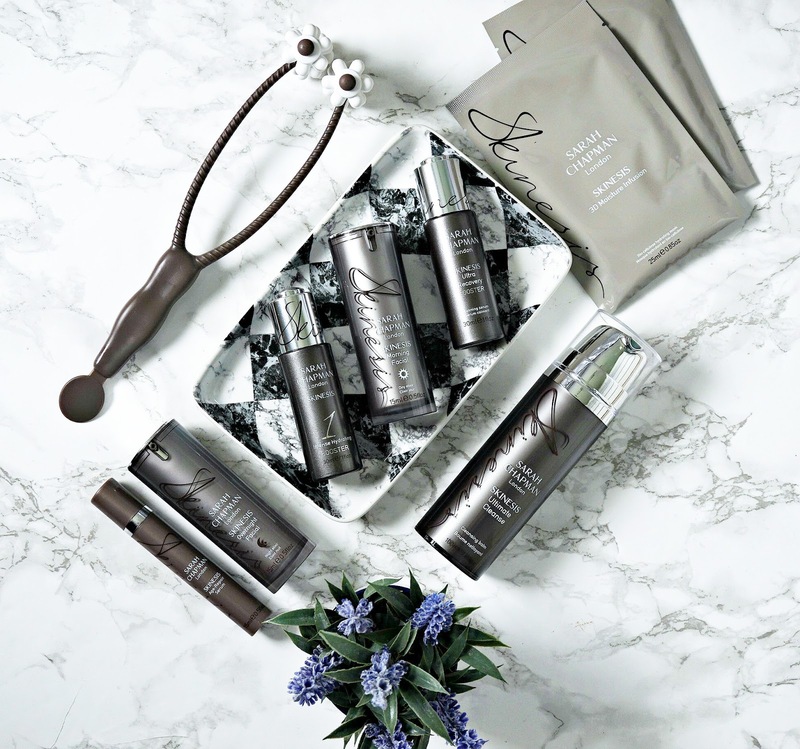 The brand I am focusing on is Sarah Chapman Skinesis, which is a luxury British brand whose aim is to create products that will give radiant, healthy, glowing skin. To find out more about Sarah who is the name behind the brand, see Fleur's video here. As with all of my other brand focus posts, this is not sponsored and I bought all of the products myself. I currently have eight products from the brand but have previously had another one that I will also share my thoughts on. As with all of my skincare brand focus posts, I will review in order of how I use the products. Ultimate Cleanse: This is one of my favourite ever cleansers - it has a creamy balm texture that makes it very easy to apply and massage into the skin. Being rich in omega oils, makes it perfect for nourishing the skin so my dry skin loves it and it also has anti-inflammatory benefits so sensitive skin will like this product. After massaging into the skin, I add water, which emulsifies it into a milk before rinsing. Skin is left deeply cleansed without being stripped, nourished, soft and smooth. Facialift: I bought this just over 3 weeks ago and I have been using it on a daily basis since then. This strange looking gadget contains 48 massaging nodules between 2 heads that help to drain, tone, refine and lift the skin around the face and neck as well as increase blood flow to help the skin look brighter, younger and healthier. I use it with my cleanser by pushing and rolling from my chin to ear and the cheek to ear, as well as on my neck. I then use the flat end to pat all over my face, which increases the blood flow. I have to be quite careful in my jaw and neck area as I have swollen lymph nodes due to illness, but the overall effect is a brighter, glowing and less puffy face. Liquid Facial Resurfacer: I love to use chemical exfoliators so I was very excited when this product was released but it was a disappointment for me. Lactic Acid usually suits my skin but there was something else in this product that my skin hated - it left it very red, tight and quite uncomfortable. Full review here. Intense Hydrating Booster: I absolutely LOVE this product. It has a silky watery-oil texture (although it is actually oil-free) and just the smallest amount intensely hydrates my skin, as the name would suggest. It is very light in texture so it absorbs easily and quickly, however the results can be felt for hours afterwards. My skin feels soft and comfortable and it looks plump. It is one of my favourite ever serums and I am now on my 4th or 5th bottle, which is pretty impressive for a beauty junkie like me who like to try lots of products. It can be used as a serum or added to your moisturiser for a boost and the dropper applicator means that I can dispense the exact amount that I need. Ultra Recovery Booster: This product was released in early summer and I knew I had to buy it. It is a frustrating product because of the packaging - the milky texture of this serum doesn't suit the dropper dispenser and it takes forever to get more than a tiny drop out. The product itself, however, is really wonderful. Like the cleanser, it is omega-rich, making it perfect for stressed out skin and also for strengthening the skin. The overall result is calm, soothed, nourished skin. I really like the product but hope that they will change the packaging as it would put me off repurchasing. Age-Repair Serum: I have a sample size of this, which came in a set that I bought but it's actually half the amount of the full size so it's pretty generous and enough for me to give it a good trial. It targets signs of aging by boosting collagen, protecting against environmental damage and plumping the skin. I've noticed an improvement in one stubborn area of pigmentation since I started to use this serum and I love the lightweight texture, yet I can feel the nourishment immediately after application. I can see myself purchasing a full size when I finish this. Morning Facial: Again, this is one of those products that I find frustrating. I absolutely LOVE what this does for my skin, but I cannot fathom why it is sold in a 15ml bottle - 15ml doesn't last jig time and most serums/moisturisers are sold in at least 30ml bottles/tubs. There is no doubting the glow that this gives my skin and I only need 2/3 drops to cover my face and neck but those are precious drops and it means that I fly through this bottle. When I use this, my skin looks like I've just had a facial - bright, plump, firm and rejuvenated. The instructions say to use it over or under your regular day cream but even on my dry skin, a moisturiser is not a necessity over this product and make up glides on effortlessly and seamlessly. I love it but want a bigger bottle without a heftier rice tag! That being said, this is my 3rd bottle so the love obviously outweighs the frustration. Overnight Facial: It will come as no surprise that I have the same issues with this product - 15ml is measly. Once again, this is housed in a bottle with pump. Inside is a bit of a miracle product and I don't use that term lightly. This oil smells beautiful, is light in texture, yet packs a hefty punch in terms of moisture, nourishment and glow. I apply this at night to clean, dry skin and massage it in and leave it to work its anti-inflammatory, anti-aging magic. The next morning, I have plump, radiant, soft, comfortable skin. I know it's expensive but I really urge any of you who are concerned with signs of aging to buy this even just once! Even if anti-aging isn't a concern for you, but you feel that your skin is looking dull and fatigued, you need this. All brides should use this the night before their wedding so that their skin is looking its best and hiding the signs of pre-wedding stress and exhaustion! 3d Moisture Infusion Sheet Mask: I won't beat around the bush with this one - it's the best sheet mask I have ever used. Yes, they are expensive at £43 for a box of 4 or £13.50 each but these masks are miracle workers - my skin looks at least 5 years younger after using one of these. It looks and feels plump, soft, hydrated, fresh, calm, firm, even, radiant and dewy. The perfect pick me up for the skin and the ideal product to use before a big event or just because you are having an "I'm worth it" moment. I would love to hear your thoughts on these products and the brand in general? Have you tried many Sarah Chapman products and are there any that you recommend I try next? Hair oils to protect, strengthen and add shine!